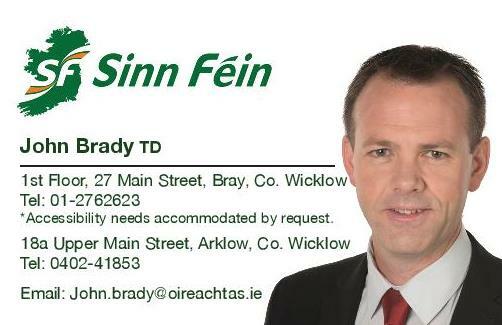 Wicklow Sinn Féin TD John Brady has called on Minister Coveney to rethink his help to buy scheme for first time buyers following the surge in prices for newly built homes since the new measures were announced in Budget 2017. “Following speculation that the scheme is already leading to a surge in prices for newly built homes I am calling on the Minister to publish any research his department has that convinced him that this scheme was a good idea. In one Wicklow development, the price of a house rose by between €17,500 and €45,000 following the Government’s new first-time buyers scheme. “Before the Minister pressed ahead with the launch of this scheme the overwhelming majority of expert opinion told him that this scheme wouldn’t work and that it would in fact make the housing situation worse. The first time buyers scheme, available on homes up to the value of €600,000 will simply drive prices even higher and lock greater numbers of people out of home ownership. It is also very telling that Government thinks that struggling first time buyers are considering purchasing homes between €400,000 and €600,000. “This new measure coupled with the recent changes to the Development Levies rates for houses by Wicklow County Council has done nothing for families struggling to put a roof over their heads. The only thing that the measures appear to be doing is lining the pockets of developers. “Minister Coveney must now provide more detail on how he intends to monitor the impact of the scheme and if evidence emerges that developers are increasing prices due to the scheme he must give a commitment to scrap it."